Basic toilet design and function has not changed much in almost a century. Most modern toilets are still simple, efficient devices, but they do require periodic preventive maintenance and repair. 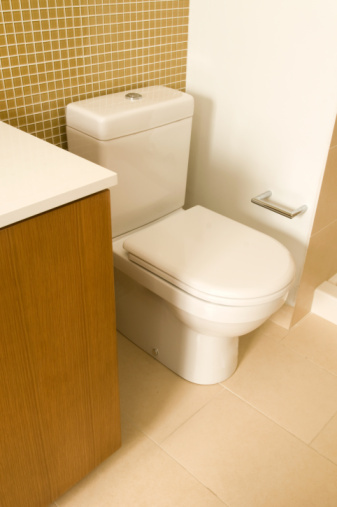 If your toilet overflows, it can be much more than a mere nuisance -- if you don't give it immediate attention, it can cause extensive and costly damage. Although serious repairs should be performed by a professional plumber, most preventive maintenance and repairs, including fixing a toilet overflow problem, can typically be performed by the homeowner. The most common cause of a toilet overflow is a blockage within the toilet or connecting waste pipes. Once a blockage occurs, subsequent flushing will cause an overflow condition. A blockage could be the result of excessive use of toilet paper or a foreign object being flushed. A waste line blockage can cause waste water to back up into your tub or shower as well as overflow your toilet. A dishwasher or washing machine draining could cause an overflow in your toilet if the blockage is in certain locations. A collapsed pipe or penetration by tree or shrubbery roots can cause a blocked main line. An insufficient amount of water per flush can cause a blockage because waste will not be completely removed from the toilet or waste line. Additional flushes to clear the bowl can cause an overflow. Obstructions in the vent piping can result in slow draining, causing backups and overflows. A blockage within the toilet can often be dislodged with a toilet plunger. If the toilet plunger does not free the blockage or the blockage is further down, a toilet auger might do the trick. For a blockage in the main line, you can rent a plumber's electric snake from most home improvement stores or equipment rental yards. To verify that the amount of water is adequate, remove the tank lid and check the water level within the tank. It should be at the water level mark on the inside back of the tank. Adjust it by moving the float up to increase the amount of water in the tank. Make sure all vent piping is clear of any debris. This may require accessing the roof, so you may want to call a professional plumber if you suspect an obstruction in the vent piping.